Chuck Palahniuk has carved out a nifty little niche for himself as somewhat of a counterculture nihilist. His anti-establishment, anti-commercialism, anti- …well…just anti- views have led to him being elevated to near demi-god status among the forward-thinking anarchistic fringes. The forums dedicated to, or focusing on, him attest to the degree of devotion his fans have. So what is the captivation here? Well…after ages of stodgy old codgers afraid to step outside the literary box, Chuck Palahniuk has done just that. Subject matter be damned. I am speaking purely of the writing itself. This is not originality for originality’s sake, but originality because the confines were stifling his expression. Combine an interesting approach to writing with a very focused and point-driven ideology and you have a formula for success. Seemingly typical of Palahniuk, the story is told in a staccato first person monologue. Sentences are clipped and deliberate. Superfluous verbiage and adverbs are non-existent. I can just imagine an editor saying, “Uh, Chuck…there’s nothing left for me to cut here.” The story is lean and mean. Gritty and visceral. Also apparently typical of Palahniuk’s writing style, the story unfolds from back to front. The book begins with Chapter 47 and works its way to the beginning. Confused? Don’t be. It all unfolds logically. The writing itself is soundbite fiction at its best. Easily digestible nuggets of fact and satirical observation, peppered with wit and insight. There is always something fascinating to provide that ‘hmmmm…” moment. The tale itself revolves around Tender Branson, a member of a death cult known as the Creedish. In this cult, the men are known either as ‘Adam’ (if they happen to be the first-born son) or ‘Tender’. The women are known as ‘Biddy’. As in, the men do the tending and the women the bidding. Cult members, excepting the ‘Adams’, are sent to the outside world to work in various positions of servitude while sending their wages (and confessions) back to the elders. They have been indoctrinated to await word from God of the deliverance, at which point they are to deliver themselves unto him (ie. commit suicide). Tender’s story begins years after the mass suicide that claimed most of the Creedish adherents. The rest of the ‘survivors’ are scattered, and are slowly killing themselves off. 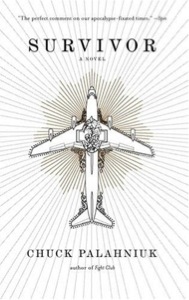 The book opens with Tender in the cockpit of a Boeing 747. He is the only one on board at this point, as he has hijacked the plane and, inexplicably in the beginning, let everyone else off. He is reciting his sordid memoirs to the plane’s black box as the plane slowly burns off fuel. As his tale unfolds, we learn that Tender works for a couple he never sees. He is their housekeeper, mentor, cover-up man and all-round go-to-guy. While describing his routine, Tender tosses out tips for discretionary affairs, criminal cover-ups and all-round ‘house-keeping’. These nuggets are one of the more fascinating aspects among the idiosyncrasies of the tale. In addition to this ‘legit’ line of work, Tender fills his spare time in other ways. Due to a misprint for a suicide help hotline advert, Tender’s phone number is listed as a contact. He begins receiving calls from suicidal marginal characters, and provides…what he feels is needed. It is through these circumstances that Tender meets the enigmatic Fertility Hollis, the sister of one of Tender’s…uh…victims. Fertility and Tender’s tale is mixed up with other broad-stroke characters/caricatures through the duration of the tale, and of course, all paths converge on the finish line in time. I can’t, or more accurately I won’t, say anything more to the plot here. This story should be allowed to play out with no pre-conceived notions attached. Suffice it to say, one will most likely be intrigued enough to stick around for the finale. Does it deliver? Wait and see. Will you be left guessing? Perhaps. Those familiar with Palahniuk’s Fight Club, will immediately see the the shots at commercial culture and consumerism which were so prevalent in that work as well. What’s that they say about not being able to teach the old dog a new trick? Or in the words of Kerouac (to be reviewed in the coming months): “You can’t teach the old maestro a new tune”. Give it a go. Ultimately quite rewarding and satisfying. Quick note: I used the delete key a lot in writing this. I believe the social parallels and links to real events are better left to discussion than the written review. Certainly we tackled many of these. I’m letting the book stand on its own here. The conclusions we at Liquorature drew will remain as our own. Interesting. Only about 85 pages left. Quick read. Nihilistic soundbite writing. I don’t mean that in a negative sense. Writing is exactly what I expected after seeing Fight Club. The story itself is much different than I anticipated. Look forward to getting everyone’s take on this one. Nice work, Pat…something a little off the radar for a few of us, I imagine. Done. Interesting read. I will be looking forward to everyone’s take on this one. Though I am not promising I’ll be farting rainbows about this book, I will have MANY positive things to say about it. Cheers to another new Liquorature direction. Kepp ’em coming, boys. Cool, sounds like a book that will be a little more polarizing than most so far! !